Portagen Powder – How to use? It is advised to pour the desired amount of water in a bottle or cup and then add this Portagen Powder. Then cap the bottle and shake well. There are no side effects yet reported for this supplement. But, it is not nutritionally complete. So, if used for a long period, then supplementation of vital fatty acids and ultra-trace minerals should be considered. Mead Johnson Portagen Milk Protein Powder with MCT for Children and Adults includes corn oil, providing linoleic acid. It is a blend of digestible protein, fat, and carbohydrate. Besides, it is iron fortified. Made using 87% of fat and medium chain triglycerides. You may use it as a part of the diet or as a beverage to be consumed with each meal. Above all, it is both lactose and gluten free. The product should be taken only under the supervision of a doctor. Store these cans at room temperature. Remember, after opening the can, keep it tightly covered and use the contents within one month. Do not freeze it and also avoid excessive heat. Equally, individuals should drink the Portagen beverage slowly and start with 1 or 2 small servings per day (until they become accustomed to the supplement). Otherwise, abdominal discomfort and diarrhea may occur. Note: Portagen contains milk protein. Portagen Milk Protein Powder is great and we love the price. My doctor suggested me this formula and I feel it’s great! 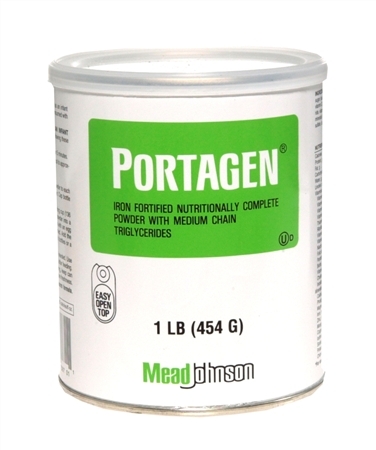 This Mead Johnson Portagen Milk Protein Powder with MCT for Children and Adults is a nutritional, milk-based mix with defects in the intraluminal hydrolysis of fat (decreased bile salts, decreased pancreatic lipase), defective lymphatic transport of fat and defective mucosal fat absorption (decreased absorptive surface, decreased mucosal permeability). Is the product available at amazon? Yes, the product is available at amazon.com. But, you may find it in a different name, made by another manufacturer like Bristol-Myers. What is a return policy of this product? There is a 30 days return policy on this product, offered by HealthProducts. What modes of payment options are available at Health Products For You? There are different choices of payment available at Health Products like Discover, American Express, Master, and Visa. The contact number is 1-203-616-2850.